Do you guys do a lot of thrift shopping? I’m admittedly horrible at it. I think if I was better at it I would do a lot more thrift shopping. It’s probably because I can be pretty impatient when it comes to shopping (or most things, really). I’ll come pretty enthusiastically to the vintage store, but quickly get fatigued after going through a few racks. The thing is, I just don’t have the stamina to find that one gem hidden amongst the tens and hundreds of duds. After I lose my patience, I’ll pretty much speed through the racks and “not find anything”. And then, of course some vintage queen will walk by carrying a heap of clothing that gets me wondering: I would totally wear all of those, where the hell did she find them?!? Dammit how did I missed all these goodies when I went through all the racks already. 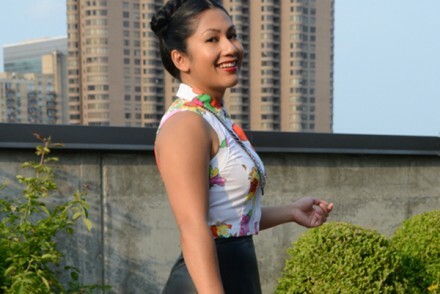 That’s why I was so excited to find Dusty Rose Vintage at the Intermezzo Collection show. They’ve got so many gems in their vintage collection, you don’t have to look hard at all. If anything you’ll probably have the opposite problem and have a hard time deciding which one you want to take home with you, since you can’t take everything. 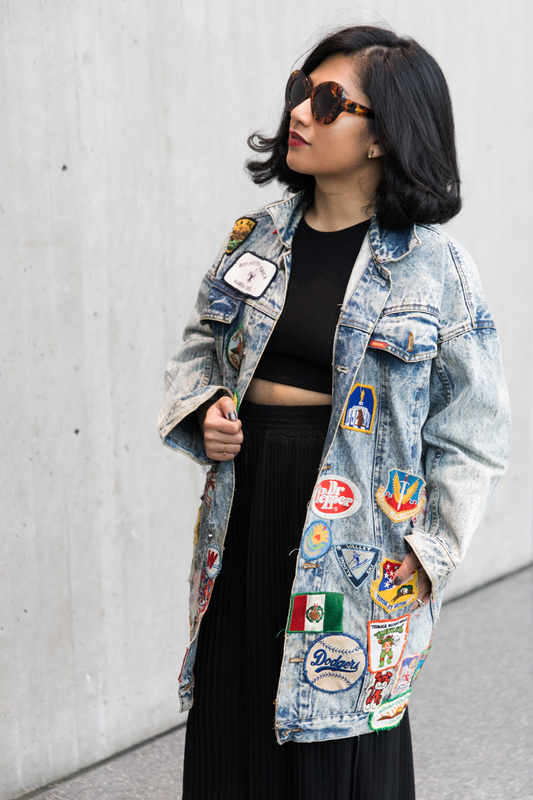 This patched denim jacket was definitely a favorite of mine — I mean talk about one of a kind piece. Of course they only had a sampling of their vintage collection at the show, so I’m planning a trip to visit their warehouse/em> soon. I can’t wait to find out what gems I’ll discover there! Who wants to go with me? Outfit Combo: vintage patch denim jacket from Dusty Rose Vintage, berkley sunglasses in tortoise from Elizabeth and James. 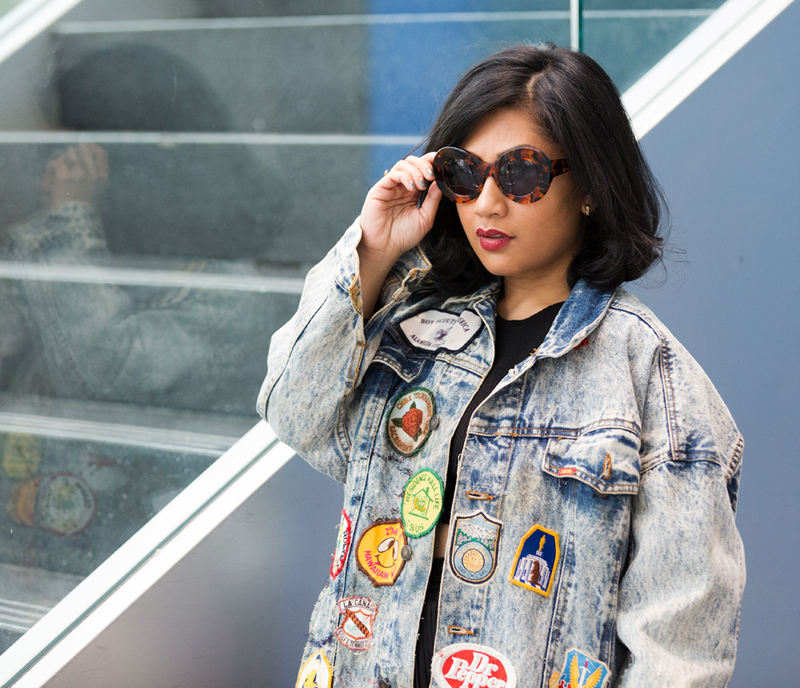 I love how you incorporated the patched denim jacket to this look. 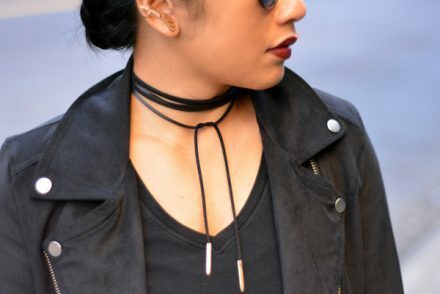 It adds an edgy vibe to a feminine outfit! These are definitely all amazing denim jeans. 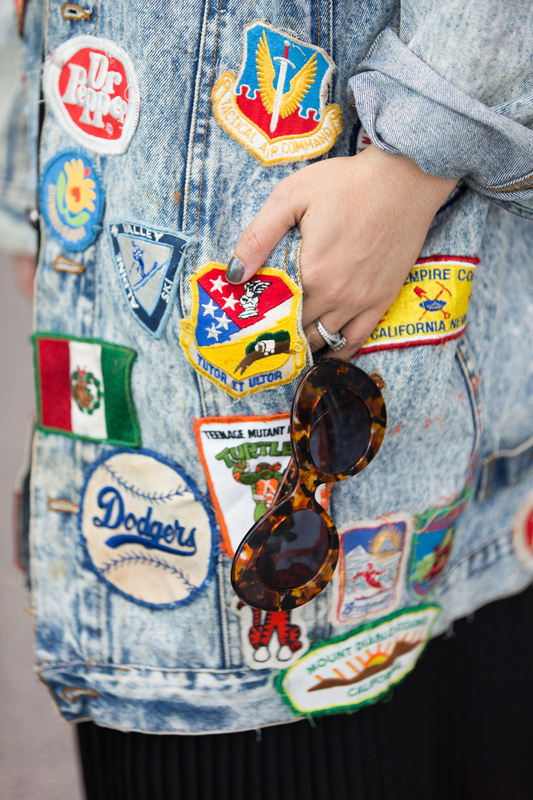 so in love with the patches on this jacket and you styled this trend perfectly! I can’t believe that jacket was thrifted! I would’ve thought that you put the patches on it yourself. It’s so cool! I’m a terrible thrifter – I think I just always end up at the stores on bad days because I can never seem to find anything cool, but all my friends manage to find the neatest pieces haha. I guess I gotta do a little bit more digging to find a gem like this! 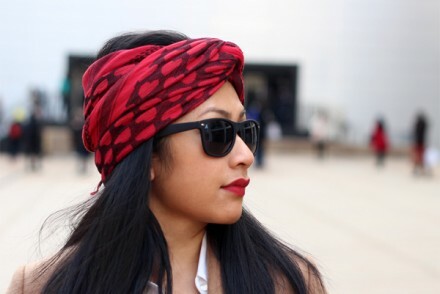 Such cute sunnies, I love statement pieces like this! What a fun jacket! I have been loving the patchwork details lately, but I don’t think I could pull something like this off. You look great! 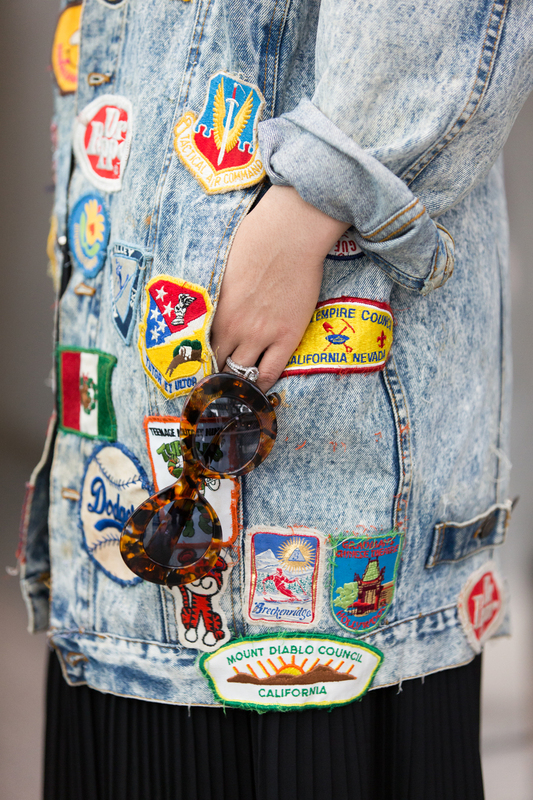 Omg I am obsessed with this patched denim jacket I need this in my life! 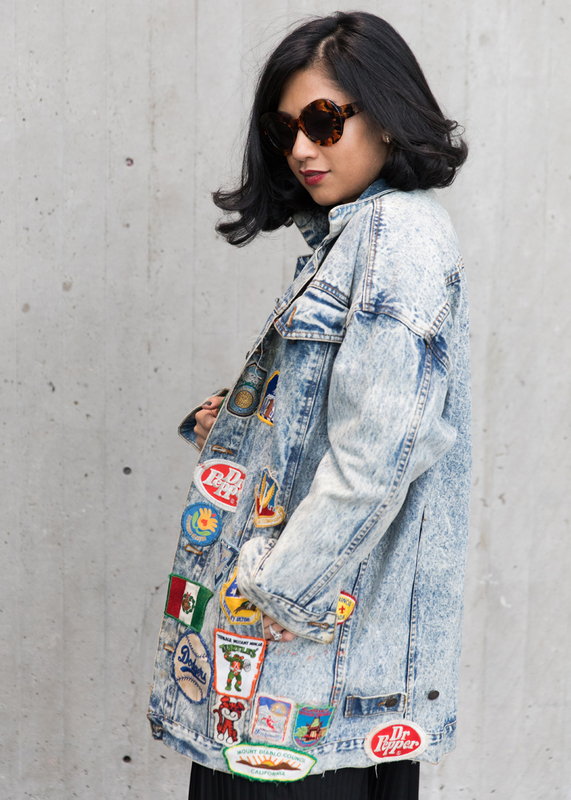 What a cool denim jacket, and I’m loving the longer length. I’m not a very good vintage shopper either.